43 years later, from being a loser, a disappointment and now a Champion. The road has not been easy. Never thought I would get to write that. As part of a crowd of thousands who flocked downtown to be part of celebration I saw young and old. Just waiting to win something. 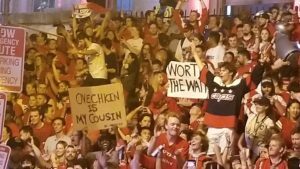 20,000 people jammed Capital One Arena and a packed, raucous festival-like throng jammed the streets. It was a night to remember. Most of the DC fanbase has been searching for a winner, a champion since 1992 when the Redskins won the Super Bowl. And now the Capitals, of all teams, have done it. The one team that could never, really, break through. And now they can’t lose. A bit of a sports miracle. In some ways they resemble the Washington Bullets of old. Aging vets that were still near the top of their game. Back then it was Wes Unseld and Elvin Hayes. Today it is Ovie and Backie. On the 40th anniversary of the Bullets line NBA Championship in 1978 over Seattle, the Caps raise the Cup. All of DC and the entire region are #ALLCAPS tonight.